A new entry-level Android 4.0 ICS smartphone has been launched by Karbonn Mobiles, called the Karbonn A6, which for now is available exclusively from Snapdeal.com, with a delivery time of four business days. Priced at Rs. 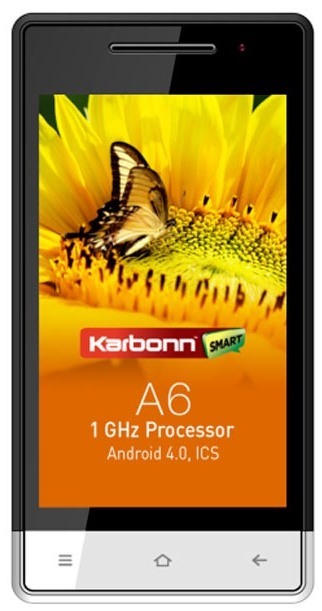 5,390, the Karbonn A6 is a dual-SIM Android smartphone, and sports a 4-inch (800x480 pixel) IPS display. It is powered by a 1GHz processor coupled with 512MB of RAM. The Karbonn A6 does not feature 3G capabilities, though it does offers GPRS/EDGE, Wi-Fi, Bluetooth, FM radio, 3.5mm jack, and microUSB connectivity. Other features of the Karbonn A6 include a 5MP rear camera with flash, a VGA front-facing camera, 104MB of built-in storage that is expandable via microSD card (up to 32GB). Its 1,450mAh battery is rated to deliver up to 3.5 hours of talktime, and 250 hours of standby time. The Karbonn A6 is 11.6mm-thick, and weighs in at 114.5 grams (without the battery). The Karbonn A6 will be making its way into a very competitive budget Android smartphone market, but seems to feature some rather decent specifications at its price, especially the 4-inch IPS display, 512MB of RAM, a relatively recent Android OS version, and a 5MP rear camera. We’ll have to see how it does when it hits the retail market.